The mission of the Tennessee Department of Agriculture, Forestry Division, is "to serve the people of Tennessee by promoting the wise use of our forest resources". This includes forest management programs that protect forest soils and maintain water quality during such activities as road construction and timber harvesting. In response to growing environmental concern, the Forestry Division has designed a water quality program that provides continuing education and assistance to managers, landowners, the state's forest industry, and the general public. The program's goal is to help these groups lessen the impacts of their operations through the application of Best Management Practices (BMPs). In Tennessee, these BMPs are non-regulatory guidelines that guide foresters, forest landowners and loggers in road construction and maintenance, timber harvesting, and the protection of streamside or riparian areas. 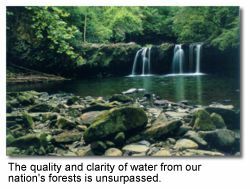 Forestry operations are not major contributions to soil erosion and water pollution in Tennessee. However, poor road construction and logging practices can cause unnecessary environmental problems. For example, compacting forest soils destroys their filtering action and affects surface water absorption. When surface water is allowed to flow down roads and trails, they become man-made streams that increase in speed and volume as they flow downstream. They tear away the soil, destroy roads, overload streams with sediment and can damage streambanks. Forested watersheds are capable of absorbing large amounts of rain and snow, as well as providing a protective layer to dissipate the erosive force of raindrops. Undisturbed forests are virtually erosion proof, since practically all precipitation that reaches the forest floor infiltrates the soil surface. Soil compaction reduces the overall productivity of forest sites by reducing absorption of water and nutrients by roots and limiting root and plant growth, thawing, and root penetration by plants. Most compaction is caused by the operation of logging and other equipment on roads, skid trails, and log landings, especially during wet weather. Only where soil is disturbed by roads, skid trails, and log landings does the possibility exist for soil disturbance and the transport of sediment into streams. Over ninety-eight percent of all soil erosion occurring on forestland in Tennessee can be traced to these three sources. Providing Education and Technical Assistance on BMP Application. The cornerstone of the Forestry Division's Water Quality Program is providing training and technical assistance to the forestry community. In the early years of the Program, efforts were focused on familiarizing as many people as possible with BMPs. More than 3,500 people attended the BMP workshops which were presented in numerous locations across the State. In 1993, the second phase of the Program expanded the Division's water quality educational efforts from large scale, formal group training to delivering BMP technical assistance to individual forest landowners and loggers before, during, and after forest management activities. Division foresters began to spend an increasing amount of their time providing water quality technical assistance. Last year forest technicians and aides completed a three-day training course, enabling them to provide assistance to Division foresters in contacting loggers and providing BMP technical assistance. Surveying BMP Implementation Rates on Forestry Operations. Every two years the Forestry Division conducts a sample survey of randomly selected logging operations in order to determine or provide a "gauge" of BMP implementation rates in Tennessee. This survey involves the identification of forest practices such as forest roads, streamside management zones, stream crossings, timber harvesting, and site preparation. Division foresters determine (with a "yes" or "no", or "not applicable" response) how the BMP guidelines, identified under each forest practice, were implemented. These responses are then used to calculate overall BMP implementation rates for forestry practices and operations as a whole. If "threats" to water quality are found, the landowner and the logger are contacted and provided with advice on how to correct these problems. Investigating Complaints Concerning Forestry Water Quality Violations. For the past ten years, the Forestry Division has investigated public concerns regarding forestry activities. This is implemented according to written policies and procedures in cooperation with the Tennessee Department of Environment and Conservation. Both Departments agree that the main intent in handling these complaints is quick resolution of the problem through the provision of technical assistance to the forest landowner and logger to facilitate the correction of improper practices. 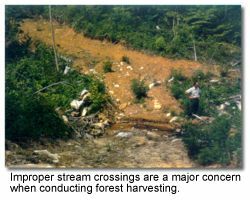 For example, a major violation of Tennessee's Water Quality Control Act is improper stream crossings, which damage streambanks and streambeds, and leave debris in the stream after harvests. Improving Working Relations Between Foresters, Loggers and Landowners. An important goal for the Forestry Division has always been to improve understanding of the principles of sound forest management. This reflects the Division's commitment to education and technical assistance. For example, the Tennessee Master Logger Program was initiated in 1992 to provide loggers and other members of the forestry community with continuing education on how to implement BMPs as part of their logging operation. This five-day course also provides training in first aid, safety, silviculture and business management. Over 600 loggers have graduated from the program since its inception in 1992. The Division's Water Quality Program is clearly becoming more effective. Each year, more landowners and loggers become familiar with BMPs, and adopt them as part of their operations. However, the real challenge lies in getting landowners to take advantage of the many services provided by the Forestry Division, including forest management assistance. For more information, contact Robin P. Bible, Forest Hydrologist, Tennessee Department of Agriculture, P.O Box 40627, Nashville, TN 37204, (615)837-5537, fax (615)837-5003.